Dispute over admitting students with debt. Wits University students said they were starting a hunger strike on Tuesday morning. About 150 people set up blankets and pillows on the floor of Solomon Mahlangu House. 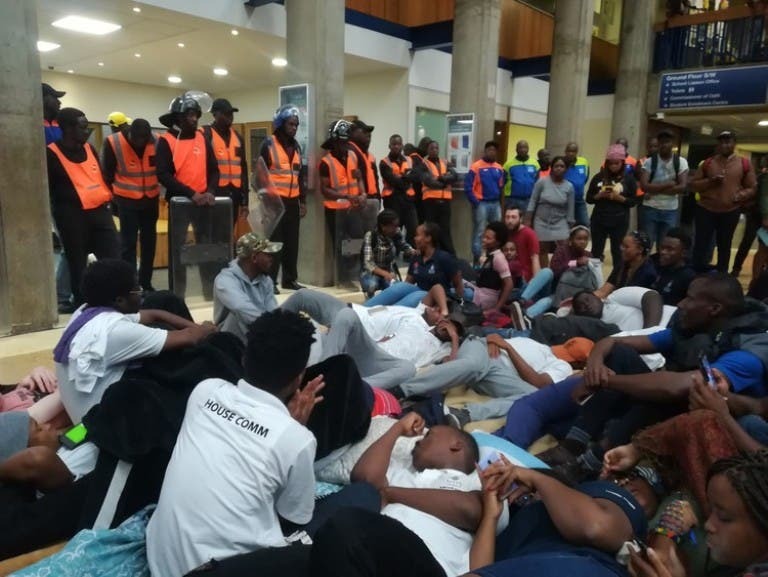 The sit-in followed protests on Monday, where students assisted by the SRC shut down lectures. 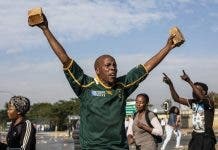 The students are protesting against a shortage of accommodation and that students with debt exceeding R10,000 not being allowed to register. “The SRC estimates over 500 Wits students will have no accommodation, over 1,000 will be financially excluded and 3,000 will go hungry each month,” said an SRC statement. About 50 private security guards, with helmets and shields, surrounded the protesters. A brief scuffle broke out between the students and the guards. “This morning we came here with our books to study while we were on a peaceful hunger strike but we were met with bodyguards,” said Wits SRC President, Sisanda Mbolekwa. She was addressing the Dean of Students, Jerome September. The SRC is demanding that all students who had been granted space at the university be allowed to register, regardless of their debt. It is also demanding Wits to provide accommodation for all students. The SRC says there should be no upfront payments for either academic fees or accommodation for students from households with annual incomes of less than R600,000. September told GroundUp that all students with historical debt below R10,000 would be able to register without a problem. He said the university had established the Hardship Fund because it realised that student debt was a problem every year. He said the fund was for students who had debt exceeding R10,000. He said Wits had put about R10 million into the fund which would provide a subsidy of up to R40,000 per student. He said that students who had applied to the Hardship Fund and were successful, with debt less than R100,000, would be able to register. With the subsidy of R40,000 from the university, most students’ debt would not be more than R100,000, said September. But students with debt exceeding R100,000 even with the R40,000 subsidy will not be allowed to register, he said. September told the students he was going into a meeting with the Hardship Fund committee at 3 pm where they would attempt to resolve the registration problems. He said he would get back to the students once the meeting had ended. 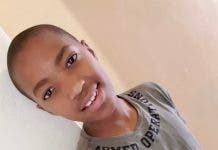 Mbolekwa said she could not understand how the university could afford to hire private security guards but claimed not to have money for student accommodation. She claimed that the university spent about R2 million on private security. Wits spokesperson Shirona Patel said the university was able to provide about 6,700 beds for students but the demand was currently for 13,000 beds. “We just don’t have enough beds and it’s difficult because government doesn’t subsidise student accommodation,” she said. The students demanded that private security is removed from the premises. But September said the university needed a commitment from students that lectures would not be disrupted and university activities would continue before private security was removed.